Burger King would like to send cheeseburgers into orbit. While the Russian Federal Space Agency (Roscosmos) says fast food is unhealthy, it will consider the proposal. 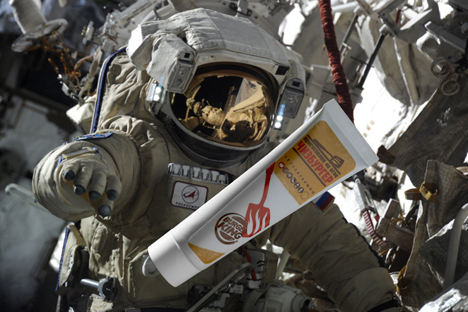 Burger King wants to feed cheeseburgers to the cosmonauts at the International Space Station (ISS), and the company has already prepared the first shipment of 100 patties. The ingredients are well-known: "grilled beef patty topped with a slice of melted cheese, crunchy cucumber, yellow mustard and ketchup on a toasted sesame-seed bun." In order for the cheeseburger to fit into a feeding tube it was chopped up and mixed with natural components to preserve its taste. Dmitri Medovoi, head of Burger King in Russia, believes the burger is "an element of earthly life" that will be a special treat for the cosmonauts. Russian doctors, however, say the burger and its recipe should first be studied. "I am personally against burgers," said Alexander Agureev, director of the ISS crew's nutrition department. "This is not the first proposal to include such food items in the cosmonauts' rations; we get such proposals often because producers see it as exceptional advertising." Roscosmos representative, Igor Burenkov, said the proposal will be studied, but he remarked that, "fast food is unhealthy for ordinary people, not to speak of cosmonauts." The food ration for space travelers is specially tailored to their needs, and must take many aspects into consideration. If the burger company gets its way, however, it will start producing burgers according to space standards in 2016. Burger King said it will also make the same proposal to NASA.